See how HubSpot's all-in-one platform can help you seamlessly build, execute, and report on every piece of your marketing. Every campaign starts with organization, and a central place to review assets and gauge performance. HubSpot's Campaigns tool is a powerful dashboard that lets you monitor and tag each disparate piece of your campaign that you build in HubSpot, from blog posts, to Facebook posts, and beyond. With unintegrated tools, it’s easy to focus on the individual components and their metrics, but not easy to focus on the larger business goals that unify your campaign. Most marketing tools are siloed, forcing marketers to manage different parts of their marketing campaign in different places. With HubSpot, it’s not longer a mystery how your marketing is achieving the goals you’ve identified for each individual campaign. Because HubSpot is an integrated marketing software platform, you can easily manage your entire marketing campaign and all the pieces from one, easy-to-use app. See how your overall campaign goals are being achieved with real-time analytics against your important marketing goals. Campaigns shows you how each individual marketing channel is contributing to your bottom line. Individual channel analytics make it easy to see how marketers can make timely adjustments to their marketing campaign for the best results. Convert anonymous visitors into leads and collect valuable lead intelligence with powerful forms that ask the right questions at the right times. Create custom forms in seconds, and start converting anonymous visitors into qualified leads. Just drag and drop the questions you want to ask right into place – no technical expertise necessary. Create custom fields, or select from a dozen different field types such as open text fields, drop-downs menus, radio select buttons, check boxes, and more. 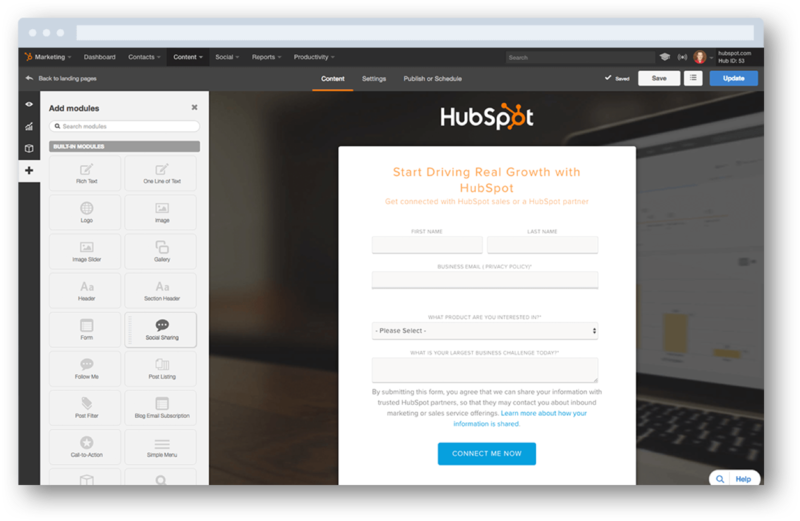 Then add your form to any HubSpot landing page, or embed it onto any external website. Block invalid form submissions and submissions from email domains you don’t trust. Then sync every detail to HubSpot’s contacts database and your CRM. Prioritize the questions you want to ask your contacts. Then show them new questions each time they fill out a form so you can learn more about your contacts over time without overwhelming them. Use smart forms to dynamically show different questions based on a visitor’s country, device, referral source, persona, and more. Use form fills to trigger automated workflows that save you time and scale your follow-up with leads. Enroll a contact in a relevant lead nurturing campaign, send an alert to your sales team, or trigger other useful actions automatically when a contact completes a form. Launch professional-looking landing pages in seconds. Your forms and your content needs a place to live. With HubSpot, you can create and test beautiful landing pages that generate leads and look great on any device – no designers or IT help required. Landing pages can be customized to mimic the appearance of your website for a seamless user experience. As with any of HubSpot's all-in-one tools, landing page performance can be seen at the campaign level, and information feeds directly into lists, workflows, and individual contact records. Quickly design and launch professional-looking, landing pages without help from designers or IT. Choose from our built-in library of mobile-optimized templates that are proven to convert, or build pages from the ground up. With the on-page editor, adding copy and inserting images and conversion forms is a snap. Display personalized content, CTAs, and forms for each and every visitor to improve the performance of your landing pages. Dynamically show different content based on a visitor’s location, source, device, buying stage, or any other contact detail stored in your CRM. Gather more information about prospects using dynamic forms that never ask the same question twice. Identify your best converting landing pages in a centralized dashboard. 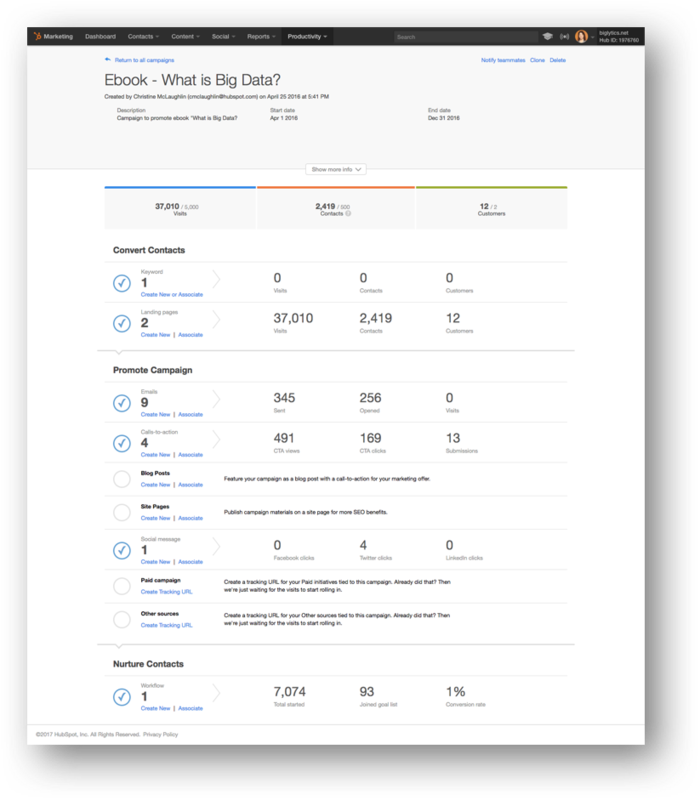 Then dig deeper to see how many visits, contacts, and customers each page is generating. Get customized keyword suggestions to optimize your page for search. Then A/B test every element, including headlines, images, calls-to-action, and more, to see which version drives the most conversions. Get the full picture for every lead in a single, integrated database. When a contact submits information as a part of your campaign, a contact profile is instantly created or updated in HubSpot. You can then create segmented lists, trigger workflows, score leads, and more from one place to simplify internal tasks, create consistent user experiences, and provide your sales team with as much data as possible. Stop wasting time combining data from disconnected tools and databases. 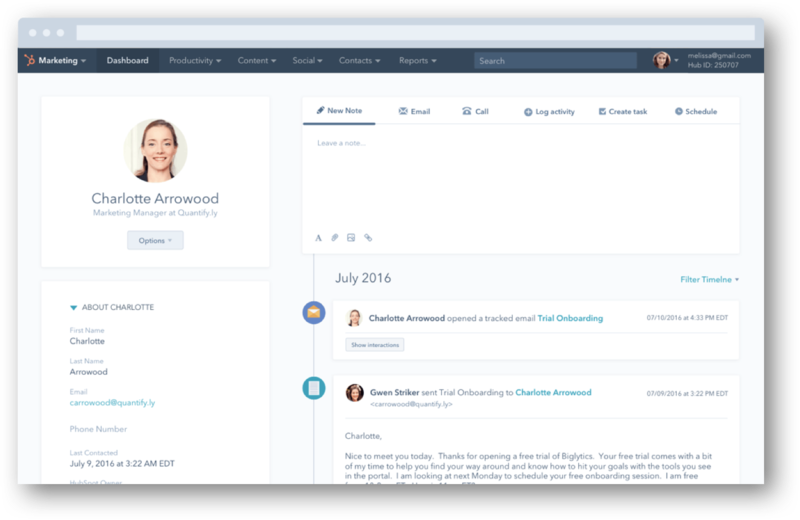 See every detail about a lead in a single contact profile, and view a chronological timeline of every touchpoint between a contact and your company, such as email opens, content downloads, page visits, social media interactions, and more. Build targeted lists, automate your email campaigns, and expand your database. Import existing contact details, build forms to convert visitors into leads and grow your database, and create unlimited custom fields to collect critical lead details. Then segment contact lists based on any data you’ve collected – properties, website visits, email interactions, and more. Use hyper-targeted segments to send emails, personalize website content, and power marketing automation campaigns so you can effectively nurture your leads further down the funnel. Make it easy for sales to identify the most qualified leads by assigning lead scores automatically. 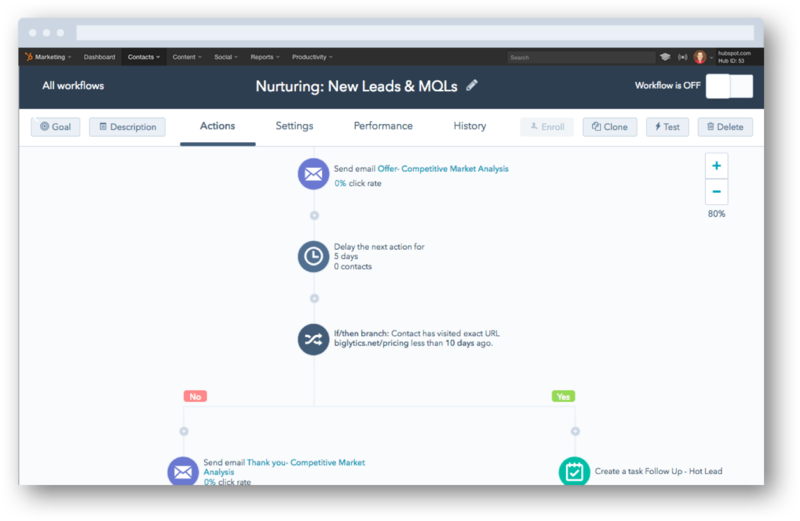 Create your own custom lead scoring criteria based on any characteristic or behavior, or let HubSpot create a predictive lead scoring system customized with your historical data in mind. HubSpot’s Workflows is automation beyond email, so you can scale your growth and spend less time on repetitive tasks. Setting up powerful, integrated workflows has never been easier. When a contact submits a form on your landing page, seamlessly trigger kickback emails, enroll contacts in workflows, send rep-notification, or update contact properties to keep the momentum of your going full speed. Automate your email campaigns so you can move prospects further down the funnel and generate more qualified leads. Build beautiful emails without ever touching a line of code. Then choose from dozens of triggers, conditions, and actions to send the right emails to the right leads at the right time. The visual editor makes it easy to envision workflows in real time – whether you’re building simple follow-up campaigns or complex, multi-stage journeys with multiple branches. Use advanced segmentation logic to determine exactly who gets enrolled in your workflows and when. 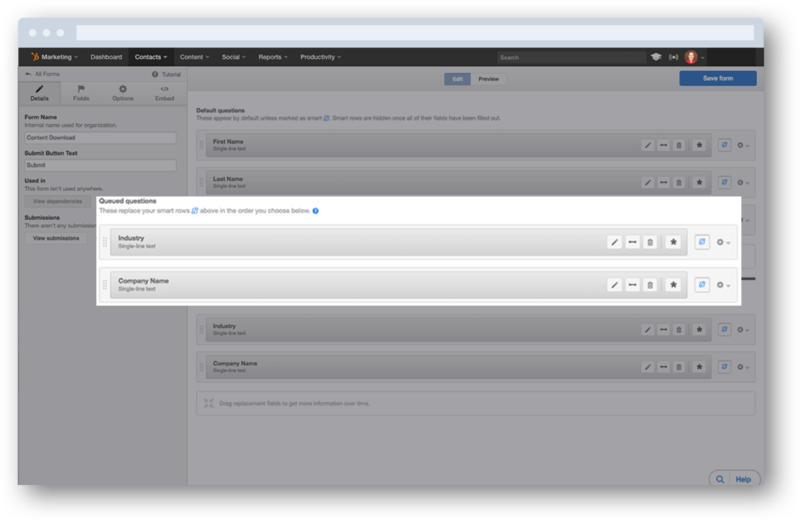 Then personalize your emails for each recipient using specific details from your contacts database or CRM. 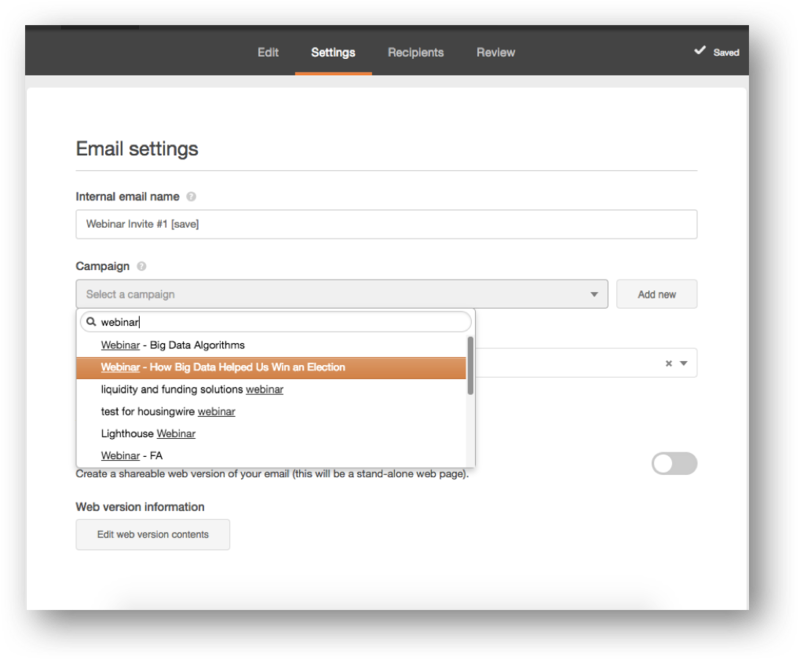 Go beyond sending emails by automating other aspects of your campaign. Use Workflows to set up webhooks, score leads, rotate leads to sales, and easily manage your data in bulk by updating properties, notifying sales, and more. Get the word out with social media, email, your blog, and more. It's time to get some eyes on your work. 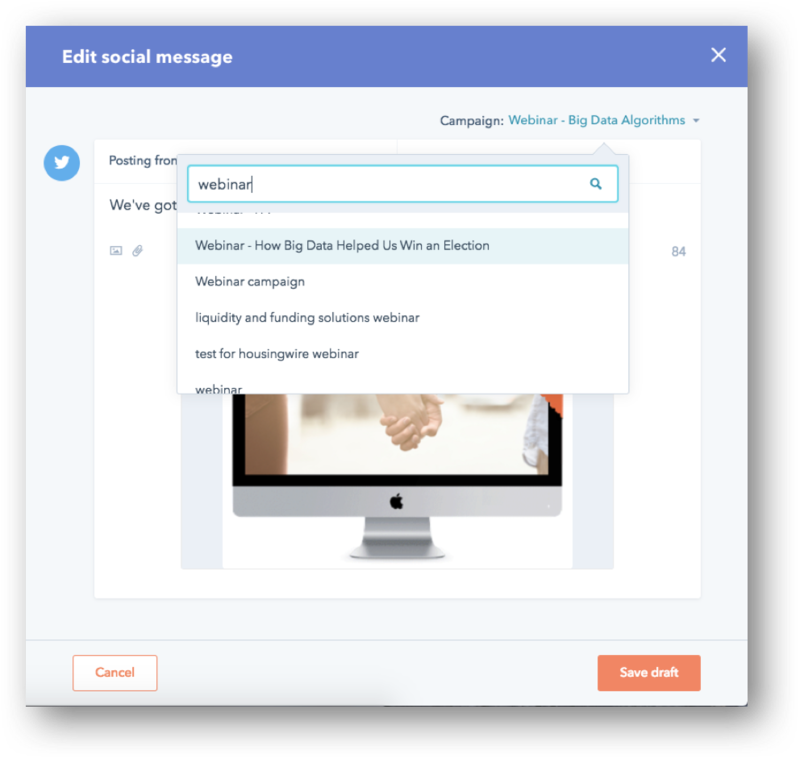 Write, publish and associate social posts, emails, blog posts, and calls-to-action (CTAs) to your campaign with the click of a button. Understand which content and platforms are driving what traffic and new contacts without creating custom tracking links or embedding code. Quickly optimize channels that need some attention, and lean into top-performers. Associate emails of all kinds back to your campaign in seconds—from invites, to kickbacks, follow-ups, and more. Promote your webinar via your blog and quickly track registrants back to the posts you write. Include a call-to-action button in your blog posts or on your website to directly correlate clicks to registrations. Drive traffic off-site with social media. Track registrants across Facebook, Twitter, and LinkedIn. Gain a deep understanding of each piece of your campaign at every step of the way. 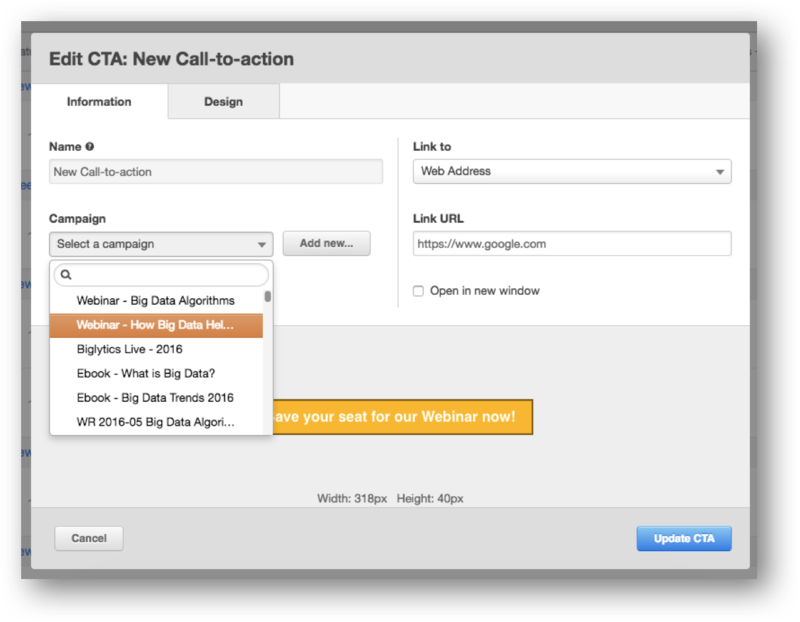 From the moment you create a campaign in HubSpot, open the door to a wealth of data. From the forms you build, to the landing pages you run, emails you send, and everything in between—HubSpot reporting can help you understand your performance. Want to learn more about how HubSpot can help you with your next campaign?